Both corn and soybean yields were exceptional in 2017, with the national corn yield being the highest ever and the national soybean yield being the second highest. Recently released county yields from the National Agricultural Statistical Service (NASS) show that many areas of the country had very high yields. For corn, many counties averaged over 200 bushels per acre in a stretch of counties beginning in central Illinois and going through southern Minnesota. For soybeans, many counties averaged over 60 bushels per acre. U.S. corn yields average 176.6 bushels per acre in 2017, the highest national corn yield in the history of the United States. Contributing to this high U.S. corn yield were many counties that averaged above 200 bushels per acre in a geographical area that began in central Illinois and extended through northern Illinois, northern and central Iowa, and southern Minnesota (see Figure 1). A scattering of counties outside this geographical area also had above 200 bushel corn yields, including counties in Washington, Idaho, the panhandle of Texas, the lower Mississippi Delta, Indiana, Ohio, Georgia, and Maryland. County yields over 200 bushels per acre have become more common in recent years. 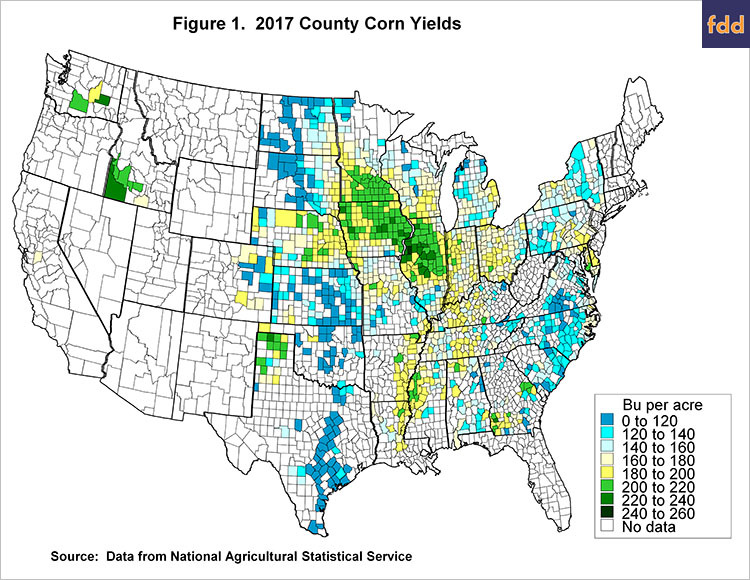 Current National Agricultural Statistical Service (NASS) data indicates that 175 counties had an average corn yield over 200 bushels per acre in 2017. This count is based on the “all” county yield which includes both irrigated and non-irrigated acres. The 175 counties account for 12% of the 1,481 counties for which yields are reported. The 12% is an all-time high. Percentages of counties with over a 200 bushel yield were 6% in 2014, 5% in 2015, and 10% in 2016. Prior to 2014, the percent of counties that had over a 200 bushel average never exceeded 2%. The county with the highest corn yield was Warren County, Illinois with a yield of 246.7 bushels per acre. The next nine highest yielding counties were Mercer County, Illinois (238.7 bushels per acre); Carroll County, Illinois (238.0 bushels per acre); Marshall County, Illinois (230.7 bushels per acre); Owyhee County, Idaho (230.6 bushels per acre); Stark County, Illinois (230.4 bushels per acre); Knox County, Illinois (229.5 bushels per acre); Adams County, Washington (228.4 bushels per acre); Tazewell County, Illinois (227.9 bushels per acre) and Peoria County, Illinois (227.7 bushels per acre). Eight of the top ten counties were in Illinois. These eight counties are located in northwestern Illinois where the vast majority of farmland is not irrigated. Weather in this area was good for raising corn in 2017. Warren County’s yield of 246.7 bushels per acre is exceptional. A 246.7 bushel per acre county average would mean that many farms had yields substantially above that average. Given historical variability across farms, it is reasonable to predict that there were farms that averaged over 280 bushels per acre in Warren County. 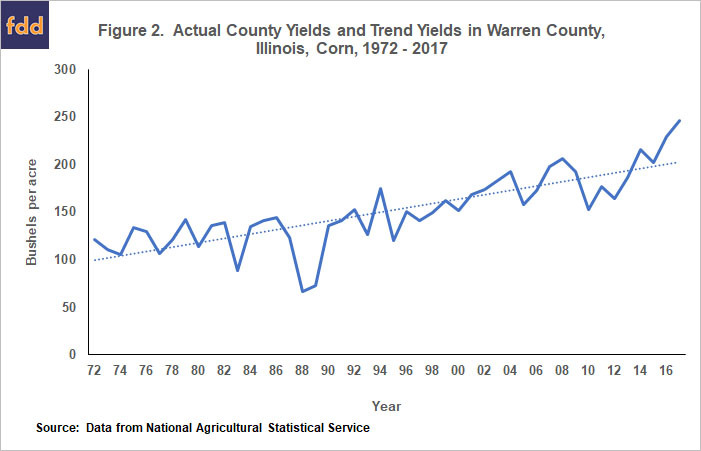 To put the 246.7 bushel yield in perspective, Figure 2 shows Warren County yields back to 1972, along with a trend line. The trend line minimizes squared deviations of differences between actual yields and trend yields. Note that all yields have been above trend since 2013. The 2016 and 2017 yields have been record setting in terms of being above trend. The 2016 yield of 229.2 bushels per acre was 28.5 bushels above the 200.7 bushel above trend. The 2017 yield of 246.7 bushels per acre was 43.7 bushels above the 203.0 trend yield. No other year since 1972 had a yield further above the trend than those associated with 2016 and 2017. Many counties had above average trends. Figure 3 shows 2017 actual yields minus 2017 trend yields for all counties for which 2017 yield data is available. The actual minus trend differences were calculated in the same way as those illustrated above for Warren County. As expected given a record-setting U.S. yield, more counties had above average trends than below average trends. 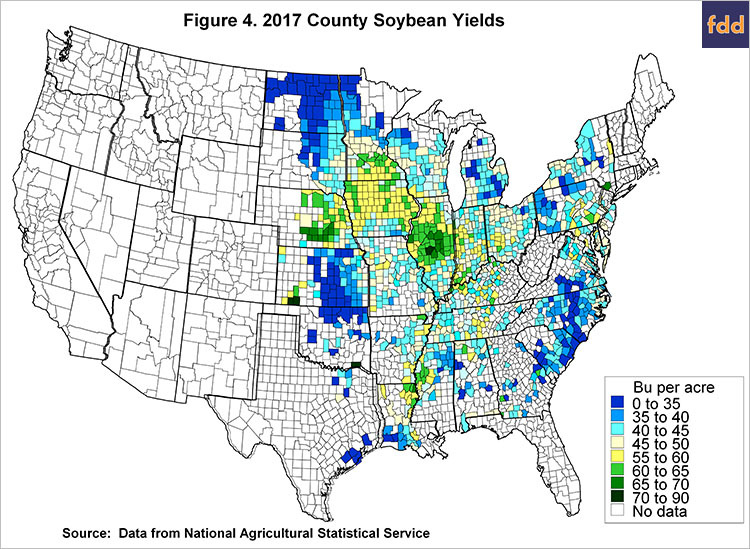 Counties that had actual yields that were over 36 bushels per acre higher than tend yields were located in Illinois and Iowa, Missouri, along the Ohio River, Mississippi and Alabama and Tennessee, along the Atlantic Seaboard, and in Pennsylvania and New York. Counties below trend tended to be in the Great Plains. Soybean yields also were exceptional in 2017. The U.S. average soybean yield was 49.1 bushel per acre, the second highest U.S. yield. The highest U.S. yield occurred last year (2016) when the average yield was 52.0 bushels per acre. As one would expect, there were many counties that had very high yields (see Figure 4). The two highest yields were in Kansas counties: 72.1 bushels per acre in Seward County and 70.4 bushels per acre in Meade County. These yields — as are all other soybean yields reported in this article — are for all acres in the county including irrigated and non-irrigated farmland. The next eight highest yielding counties were Sangamon County, Illinois (70.3 bushel per acre); Choctaw County, Oklahoma (70.0 bushels per acre); Piatt County, Illinois (69.4 bushels per acre); Orange County, New York (69.2 bushels per acre); York County, Nebraska (69.0 bushels per acre); Kearny County, Nebraska (67.8 bushels per acre); Hamilton County, Nebraska (67.7 bushels per acre); and Buffalo County, Nebraska (67.4 bushels per acre). Unlike corn, high yielding counties were spread throughout the United States. While over 60 bushels per acre yields occurred across the United States, there are geographical concentrations of counties that have over 60 bushel per acre corn yields (see Figure 4). Most counties in central Illinois averaged over 60 bushels per acre. Eastern Nebraska also had many counties that had over 60 bushels per acre soybean yields. Counties along the lower Mississippi River tended to average over 60 bushels per acre. Some counties in Iowa and southern Minnesota also averaged over 60 bushels per acre. In 2017, 94 counties had yields above 60 bushels per acre, representing 7% of the 1,353 counties for which yields were reported. The 2016 percentage was higher at 13%, as expected given the record breaking national yield at 52.0 bushels per acre. Percent of counties with over 60 bushel soybean yields were 4% in 2013 and 6% in 2014. Prior to 2014, the percentage never exceeded 2%. Many counties had 2017 actual yields above trend (see Figure 5). 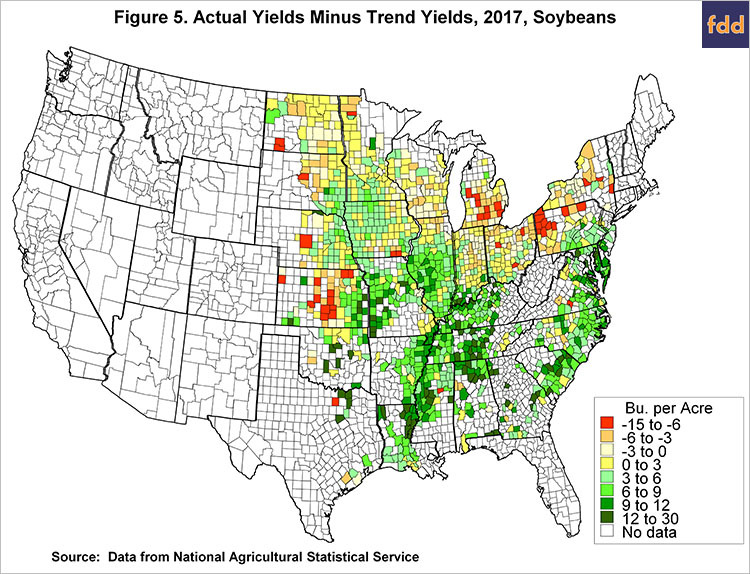 Yields considerably higher than trend were scattered throughout the southern portions of the United States. 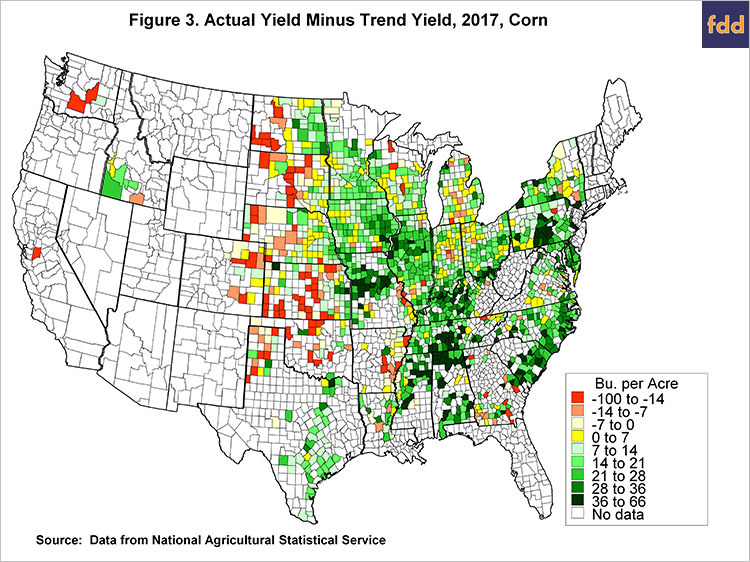 Concentrations of counties with actual yields were 12 bushels over trend were located in Missouri, along the lower Mississippi and Ohio Rivers, in Alabama and middle Tennessee, South Carolina, and Maryland. Many areas of the country had above trend yields in 2017. While still not the majority, county yields of over 200 bushels per acre are becoming common and may be expected in the center of the corn-belt. Similarly, counties with over 60 bushels per acre are occurring with some regularity. Over time, county averages over 200 bushels per acre for corn and 60 bushels per acre for soybean likely will become more common. As always though, it is important to remember that weather and other growing conditions play a large role in determining yields. Lower than trend yields will happen across all counties sometime in the future.